Dating app Bumble will start banning photos with guns or knives in them. The ban does not apply to users in the military and law enforcement who are in uniform. Users will have the option of appealing to get individual photos reinstated. Dating app Bumble is joining the list of companies that have distanced themselves from the promotion of guns in the wake of the deadly school shooting in Parkland, Florida. Bumble announced in a blog post on Monday it will begin to ban photos that include guns or other dangerous weapons like knives. Entire profiles will not be banned, but individual photos will be taken down. The new policy does not apply to users in the military and law enforcement who are in uniform, the company said. “As mass shootings continue to devastate communities across the country, it’s time to state unequivocally that gun violence is not in line with our values, nor do these weapons belong on Bumble,” the blog post says. Bumble, which was created as a “female-first” dating app, has taken a similar approach to moderating hate speech and inappropriate sexual content with a zero-tolerance policy. 5,000 moderators will search through every new and previously uploaded photo and remove any that don’t adhere to the new guidelines, The New York Times reported. 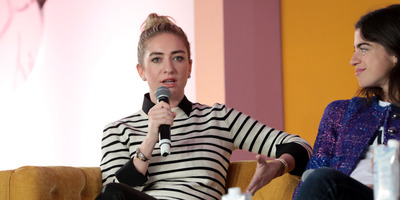 Eventually, Bumble will filter out mentions of guns in written content as well, Whitney Wolfe Herd, Bumble’s founder and CEO, told The Times. Herd also acknowledged that the issue of gun ownership is a grey area and the new policy could potentially affect users who don’t endorse violence, like gun hobbyists and professional sport shooters. In these cases, she tells The Times, users can appeal to have their photos reinstated. Bumble also announced it is giving $US100,000 to March For Our Lives, a protest for stricter gun control being organised by the survivors of the Marjorie Stoneman Douglas High School shooting last month that left 17 students dead.